TORONTO -- Ontario's new Progressive Conservative government vowed Thursday to bring in sweeping changes meant to restore public trust in the province in a throne speech that played up promises made by Premier Doug Ford during the spring election campaign. The speech -- written by the premier's office and read by Lt. Gov. 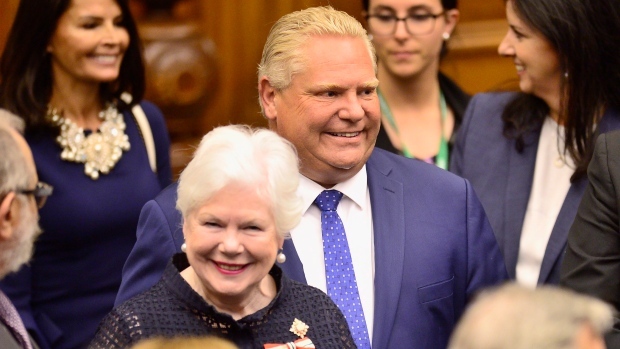 Elizabeth Dowdeswell at the Ontario legislature -- set out a road map for the new Progressive Conservative government's term, pledging to cut taxes, provide long-term funding for the health-care system and slash government waste. It did not introduce major new promises but instead highlighted key pledges from Ford to conduct a line-by-line audit of all government spending, pull out of the cap-and-trade system and fight what his government calls "oppressive" taxes, including the imposition of a federal carbon price. The government has been given "a clear mandate from Ontarians" to carry out its vision at a pivotal time for the province, the speech said. "The fact is that Ontario is at a critical juncture. We face mounting challenges at home and abroad. These challenges, if left unchecked, threaten livelihoods and imperil public services," it said. "We cannot afford to dither or delay. To overcome these challenges we must challenge the status quo, reject the old compromises and embrace change." The government stressed the need for collaboration -- with other levels of government, with parents and teachers, with law enforcement -- in vowing to restore faith in public institutions. "In a time of global turmoil and change, maintaining and strengthening the bond between the people and their public representatives must always be top of mind for us all. It is very much top of mind for your new government," it said. The speech promised the government will take action to reduce taxes for parents, small businesses and the working poor, and pledged to bring down electricity bills. It further said the government will provide stable health-care funding, including a $3.8 billion investment in mental health, addictions and supportive housing. However, it made no mention of one issue the government had said would be one of its priorities for the rare summer sitting of the legislature: ending an ongoing strike at York University. Ford nonetheless stressed those priorities in a statement Thursday, saying his government would get to work quickly so "people can see real change fast." "We are ending the deadlocked strike at York University so students can get back to school. We are striking the cap-and-trade carbon tax from the books. And we are cancelling unnecessary renewable energy projects to help lower your electricity bills," he said. In the statement, the Tories said the summer session will build on the work their government has already undertaken, such as steps to dismantle cap and trade and measures to curb government spending. Ford, who began making policy changes even before he was officially sworn in as premier, made good on two key campaign promises Wednesday. The premier also announced the immediate retirement of the CEO of Hydro One and the resignation of the utility's entire board of directors. He said the move would bring down electricity rates but struggled to explain how when asked repeatedly by reporters. The Tories have also taken several other steps since their victory last month, including putting a number of laws passed by the previous government on hold. Among them are legislation to strengthen oversight of law enforcement and redefine police officers' duties, and to tighten rules around vaping. Their decision to cancel cap and trade has also put an end to a number of initiatives funded from the program's revenue, such as rebates for green retrofits and a $100 million fund for school repairs.